Heritage Festival event is booked out. There is a waiting list on Eventbrite. If you like ‘firsts’, this is a walk for you. 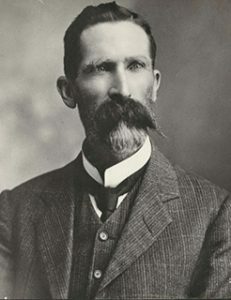 Charles Robert Scrivener not only surveyed Canberra: he recommended the present site of Australia’s federal capital as the best of those in the Yass-Canberra district. In March 1909, he began the first contour survey, placing his trigonometric survey marks on Canberra’s hills. Some of those survey marks evolved into the first Canberra place names of the Commonwealth period. The remains of Scrivener’s survey camp also became the earliest Commonwealth settlement in what became the Australian Capital Territory. Length and terrain: This 3.5 km walk will be in two parts with moderate slopes and some dirt tracks. It will start in Stirling Park with a visit to the Gap survey mark. After a short car transit to the Federation Mall, we will visit the Camp Hill site and the western side of Capital Hill. The walk will cover several of Scrivener’s 1909 survey marks and the features that influenced his selection of the Federal city site. We will also see places where the early builders of Canberra lived, played, and used the work of the surveyors to create the first infrastructure of Canberra. Please wear sturdy shoes or boots.